The government is claiming that a new bill tabled in front of Parliament yesterday will provide “real and practical” help through the tax system to the people suffering from the effects of the Christchurch earthquake. 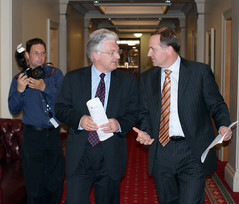 Peter Dunne explained that the New Zealand government is actively assisting the victims of the Christchurch earthquake, and the Inland Revenue Department has also made concessions to individuals and businesses affected by the disaster. However, the national tax system was never designed to handle impacts such as the earthquake, and regulatory changes were needed to adequately address the new reality. The new Bill aims to provide tax reliefs for businesses that donated their trading stocks to the Christchurch relief efforts up until March 31st 2012. It is intended for exemptions to be applied to corporate tax and gift duties. Additionally, welfare contributions made by employers to employees within eight weeks of ether earthquake should be tax exempt. If passed, the Bill will also extend redundancy tax credits to September 30th 2011, and grant the Commissioner of the Inland Revenue Department emergency powers to grant tax exemptions for certain types of incomes as needed.